That seemingly simple but very crucial and scary question must have been on the lips of Baragbon and his people back in 1775, when the over 1,500 Esie Soapstone Statues were discovered in mysterious circumstances in the thick forest. At the time of its discovery, the site of the images was said to have been at a distance of about 300 metres from the inhabited parts of the town. Today, about 243 years after that historic event which positively altered the fate and fame of the town and placed it on the map of the world at a time when most of the bigger towns in today’s Nigeria were still shrouded in total obscurity, that question still remains without an answer. Certainly it is not for want of efforts; just that the Esie Mysteries, as they are most often referred to, have so far defied all previous efforts to unravel them. Apart from many known denigrating attempts by early Eurocentric anthropologists who laboured in vain to dismiss the statues as no more than primitive and valueless art, various other dispassionate attempts have been, and are still being made by scholars, researchers and archaeologists to proffer an acceptable answer to that most persistent among many questions about the origins and purpose(s) of the Esie mysterious images but every likely answer has only succeeded thus far in yielding to many more questions. Precisely 170 years after Baragbon’s historic discovery of the Statues and about two years after the founding of the Nigeria Antiquity Service, now known as the National Commission for Museums and Monuments (NCMM), the British Colonial Government had established the first ever Museum in Nigeria. The year was 1945. The place was Esie, in present day Irepodun Local Government Area of Kwara State. And the main purpose was to preserve the unique Soapstone Statues, and terra cotta heads ‘reminiscent of Ife and Nok’ that were first discovered in 1775 by the people of Esie town. That, in a nutshell, was the beginning of what is widely acknowledged till date as the mother of all museums in Nigeria, the Esie National Museum. 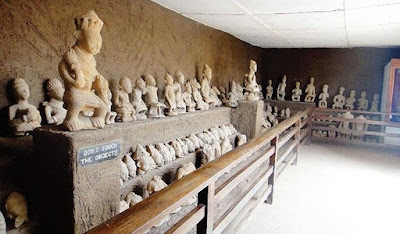 Although Nigeria is well known for her many attractive sculpture traditions with some dating back several centuries before the advent of colonialism such as those from Ife, Owo, Benin, Nok, Ikom, Oron, and Igbo-Ukwu, most experts agree that by far the most realistic, unique and mysterious of all are the Esie Soapstone Statues. Esie, about 53km from Ilorin, capital of Kwara State, is an ancient Igbomina Yoruba town that is rich, very rich, in unique historical monuments, including the Cathedral Church of Saint Michael (Church of Nigeria, Anglican Communion) which celebrated a centenary six years ago; the Elesie’s ancient palace; the burial place of past Esie monarchs at Agbo Ile Ooye; Baragbon’s final resting place at Oke-Sanlu on which stands today a distinct monument with a modest plaque that lists the names of all past Elesie; various historical tools and artefacts, but the Esie National Museum, which houses the world’s largest collection of realistic human representations in African Stone Sculptures is the main attraction to the town. According to oral historical sources, including the Elesie of Esie Land, His Royal Majesty Oba Yakubu Babalola Egunjobi II, Baragbon was reputed for constantly embarking on hunting expeditions during which he usually spent many months in the bush. They attest to the fact that it was during one of such activities that the more than 1,500 statutes in soapstone were discovered together in the bush by the founder of Esie and renowned hunter in 1775. After their initial fears of the mysterious images, the Elesie continued, the people consulted ‘Ifa’ and were given assurances that the Stone Images were harmless; rather, they would guard and protect the land and its people. They eventually appointed a Chief Priest (Aworo) called ‘Ayarun’ in the Igbomina variant of the Yoruba language to lead the regular worship of the stone statues. The statues were the most dominant gods in Esie cosmology but with the advent of Christianity and Islam, Esie people have stopped worshiping the images. Documentations of earlier oral sources have it that Baragbon had found the statues neatly seated in a semi-circle formation under a palm tree with the ‘Oba Ere’ (King) of the images seated in the middle as if presiding over a community meeting. A tree known locally as ‘Peregun’ was planted to demarcate the site of discovery in 1775. It is very interesting that fresh excavations carried out in 2008 revealed that more of the statues are still buried in the ground. Another important and interesting site within the Museum compound is the Shrine where the people of Esie used to worship the mysterious statues before the advent of western and other foreign lifestyles and religions. The shrine is arranged in three layers with the King, the Queen and errand or slave boy in sitting positions. Some paraphernalia of office are also on display. Available information at the Esie National Museum indicates that the Soapstone Statues range in height from 14 to 120 centimetres and weigh between 0.55 and 104 kilograms. They are described as realistic representations of men and women mostly seated on stools and sometimes kneeling. Royalty and well being pervade the soapstone collection as many of the stone images are adorned with beads and headgears. Some of the statues play musical instruments, hold machetes, arrows, and other objects. Others simply place their hands on their knees as if they are in deep contemplation. Their various facial marks, diverse and rich paraphernalia, occupations and elaborate hair dos attest to the strong likelihood of earlier contacts between the people of the area and other major civilisations in parts of Africa South of the Sahara. In addition to the Yoruba culture, some sources have suggested links (quite evidently) between many others as they depict styles identifiable in parts of Nupe land, Benin (Edo), South Sudan, Egypt, Ghana, among others. Besides, the artistic sophistry and aesthetic values are further buttressed by the accuracy of rendition of the various highly elaborate hairstyles; the skills, technology and vision that could have produced the Esie masterpieces remain mysteries to be unravelled and that will never cease to awe those with creative inclinations. She informed that the Esie Monuments Festival Foundation, which she chairs, was established by concerned culture patriots of Esie origin to ensure the preservation, protection and projection of all Esie cultural heritages for the benefit of the people and community. It also aims to call due attention to the plights of the museum. One of the platforms by which it seeks to carry out this task, she explained, is the Annual Esie Monuments Festival which is premised on the first ever National Museum in the country. Instead of promoting a deliberate policy of cultural amnesia and expending huge resources to encourage the patronage of less-significant foreign tourist destinations, the governments at all levels should be giving young Nigerians the gifts of the many good values that the nation’s heritages offer, she appealed. While explaining that the history of the festival dates back to the year 1850, National Secretary of the Foundation Mr. Ololade Oyeyipo said the modernised, tourism-driven Esie Monuments Festival began in 2005, with the commemoration of the 60th anniversary of the Establishment of the Esie National Museum, the first Museum in Nigeria. He told this writer that the Esie Stone Statues had actually been attracting local and foreign tourists before the formal establishment of a museum to house the images. “For example, as early as the year 1912, the respected German traveller and anthropologist Leo Frobenius had visited the site of the museum and was astonished by the size and sophistication of the stone carvings,” he said. He, however, expressed hope that the new gallery built by the Federal Government will be put to use so that Esie National Museum will no longer be poorly housed in the old gallery that was built by the community 66 years ago. He urged the Federal, State and Local Governments to accord Esie National Museum and the host community the attention, assistance and respect they deserve. The Esie Monuments Festival, which has been put on hold for a while, usually held for three days in April starting with an International Workshop/Launch at Kwara Hotels, Ilorin. Events for the second day would include the Flag-Off of Hunting Expedition, Food Fest/Exhibition and Traditional Musical /Cultural Displays at the Esie National Museum grounds. Apart from the Hunting Expedition Final, Cultural Performances and Masquerade Dances are featured at the Grand Finale of the Festival. For families, groups and individual visitors to the museum (and they never cease coming), there is a lot to see, learn and enjoy with the kind assistance of the Curator and her team of skilled personnel of the National Commission for Museums and Monuments and the introductory notes strategically positioned at the entrance of the gallery. If the Esie National Museum were a Republic, the ‘Oba Ere’ (King of the Images) and his subjects would have conferred the NCMM staff with various national honours and citizenship; but even after years of living, working, caring for and interacting with the Esie Soapstone Statues, the Curator and her colleagues still have no answer yet to the simple question on every visitor’s lips. One can only hope, along with numerous others across the world who have encountered the mystery of the Esie National Museum over the past 243 years, that one day in the future, providence will shed divine light on scholars’ and researchers’ paths to the right answer to that age-long question: Who Carved the Esie Stone Statues?